When the wind blows and the weather turns cold, there is nothing that feels better than wrapping yourself in a nice, warm blanket. Old man winter can howl all he wants outside your window, but inside you're toasty and warm. A blanket box is the perfect addition to your bedroom furniture where you can safely store extra bedding until needed. Why limit it to blankets when you could keep the family's favorite games accessible in a "coffee table" right in the living area. The uses are endless and the look is timeless. 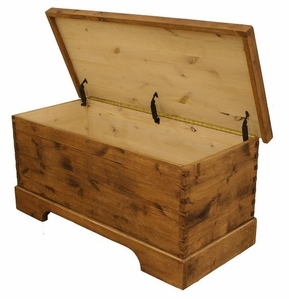 LodgeCraft has several options for storage in the form of blanket boxes and trunks. Select from pine or alder blanket boxes made in our Montana workshops, Oak and Cherry mission boxes from Oregon and a handful of quality imported blanket boxes and chests.